Shrimp Cups Recipe - this is one kind of tasty healthy and crispy food to eat. People who love to eat this food must try to make it in your home. If you love to cook then this recipe will help you to easily understand to make it in your home. 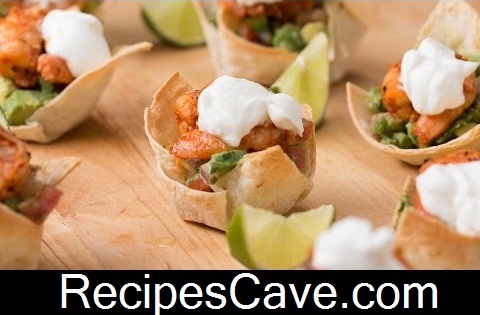 Here is the step by step process to make the best shrimp cups recipe. 2. Butter each side of the tortillas and cut into even quarters, making 24 pieces. 3. Place one piece in each cup of a muffin tin and push down so it creates a cup shape. (Make 2 batches or use 2 muffin tins to make the full amount of cups). 4. Bake for 10-12 minutes or until crisp. 5. In a bowl, mix together shrimp, salt, pepper, cumin, paprika, chili powder, cayenne, garlic, and lime juice. 6. Cook over medium high heat for 8 minutes, flipping halfway. Set aside. 7. In another bowl, combine diced avocado, tomato, red onion, jalapeno, cilantro, salt, and pepper. Stir gently. 8. Assemble the cups by placing a spoonful of the avocado salsa in the toasted cup. Place a piece of shrimp on top, followed by a dollop of sour cream.